Battery point, with the Gant Bridge looming over The Pleasure Domes Club. 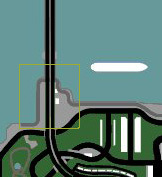 Battery Point is a district of San Fierro, San Andreas. It is situated under the Gant Bridge at the city's northwestern tip. To the east is Esplanade North; to the south are Juniper Hollow and Palisades. 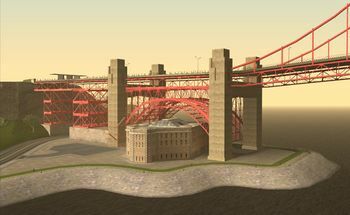 This area is modeled after San Francisco's Fort Point, which sits underneath the famous Golden Gate Bridge, after which the Gant Bridge is modeled. Like Fort Point, Battery Point provides stunning scenery and a chance to unwind and enjoy the bay. Frequenters of Battery Point are very diverse, as people from all over San Fierro come to this district to relax and enjoy their city's natural beauty. Pedestrian traffic is heavy around The Pleasure Domes Club, which sit directly underneath Gant Bridge's scaffolding, providing after-hours adult entertainment. Battery Point is also a stronghold for the local San Fierro Rifa gang, who is led by T-Bone Mendez, a member of the Loco Syndicate. After his arrival in San Fierro, Carl Johnson has some hard work ahead of him: the garage he won in a street race with Claude and Catalina is in desperate need of renovation, and the entity responsible for the events leading up to this point, the Loco Syndicate, is largely based in this new city, with its most prominent figures close by. With the help of his newly acquired friends, The Truth, Dwaine, Jethro, and Zero and his closest ally from Los Santos, Cesar Vialpando, Carl manages to not only turn the derelict garage into a successful chop-shop, but also establishes himself as an entrepreneurial force in San Fierro by acquiring properties and businesses throughout the city. Carl then turns his attention to dealing with the Loco Syndicate. He learns that the San Fierro muscle end of the syndicate is headed up by the pimp Jizzy B., whose Pleasure Domes Club sit under the Gant Bridge in Battery Point. Carl makes several trips out to Battery Point in order to gain Jizzy's trust by working for him as what Jizzy refers to as "dumb muscle". After successfully eliminating Jizzy's competition throughout San Fierro, Carl meets another head of the syndicate, T-Bone Mendez, at Jizzy's place in Battery Point. Mendez then receives a call from a kidnapped Mike Toreno, who is calling from a dying cell phone. The three men locate and rescue Toreno, finally allowing Carl the pleasure of his acquaintance. Toreno turns out to be the man behind everything Carl has experienced thus far. With the pieces of the puzzle finally in place, Carl begins his systematic destruction of the Loco Syndicate by paying Jizzy an unexpected visit at the Pleasure Domes Club. Carl sneaks in and confronts him, but Jizzy runs out the front door, and forces Carl to pursue him in a high-speed automobile chase through Battery Point and into the Palisades and Paradiso districts of San Fierro. After killing Jizzy and snatching his cell phone, Carl is able to locate and kill both T-Bone Mendez and his old Grove Street Families associate Ryder during an ambush of a meeting between syndicate members at Pier 69 in Esplanade North. Afterward, Carl locates and shoots down a helicopter that was seen fleeing the meeting, presumably carrying Mike Toreno. This page was last modified on 27 July 2012, at 14:52.